Here is a video of climbing the mast. Click HERE to view the video. 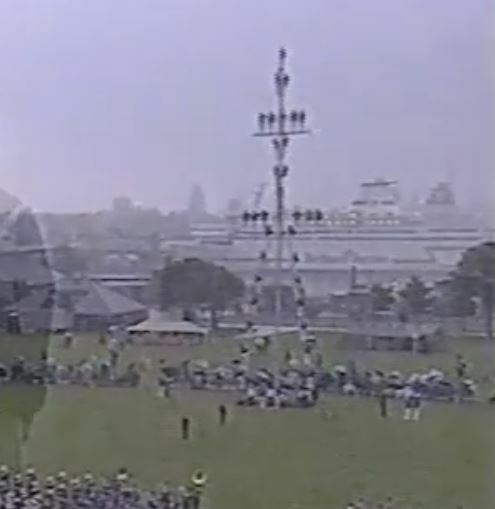 97 FEET AND NOT A SAFETY HARNESS IN SIGHT – ROYAL NAVY MAST MANNING – Accompanied by an international Massed Bands playing the traditional naval sea shanty ‘Westering Home’, the Royal Navy perform Ceremonial Mast Manning in 1994. I was fortunate enough to witness this live when I was on HMS VICTORY during Long Look 94 during Navy week. I think that this could have been the final time it was performed primarily because of OSH concerns. Were you Nelson’s cabin boy Mole? Was performed live at my passing out parade at HMS Ganges. Very spectacular and very much part of the traditions of the service in 1965.